You will all know the familiar saying about never working with animals or children on TV. 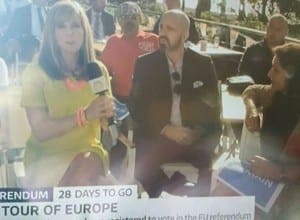 After my recent appearance on ITV’s Good Morning Britain, that saw me holding forth on all things EU referendum with presenter Kate Garraway, some might be tempted to add ‘bald bearded expats’ to that list. However, my TV history actually dates back to the 70s. I had a happy birthday message read out on the brilliant and anarchic Tizwas – hosted by Chris Tarrant long before his ‘Who wants to be a Millionaire’ heyday. A kids breakfast TV show that was hugely enjoyed by adults, Tizwas featured Spit the Dog, the Phantom Flan Flinger and a very young Lenny Henry. Blue Peter was the other show that shaped my childhood, very much the polite and good-mannered choirboy to Tizwas’s problem child. I tried in vain to get a Blue Peter badge. It’s probably scarred me emotionally somewhere. My first proper appearance on TV came in the late 90s. The Jerry Springer Show was a huge hit over in the US and regional TV stations in the UK decided that they needed their own combative talk shows. The only problem was that they needed guests who could talk semi-intelligently in front of the camera, wouldn’t swear and wouldn’t end up knocking seven bells out of each other. A harder task than you might think for an embattled producer, so an actor friend of mine set up a covert agency to provide ‘members of the public’ for the shows. And it really was no expense spared with me being picked up in a limo from London, driven to the studio (it was normally Central TV so that meant Nottingham) being allowed to indulge myself of the free-flowing hospitality in the Green Room and then having my 15 minutes of fame, normally as the bad guy. On my return to Marbella I was swift to sign up with a couple of agencies that needed, ahem, ‘interesting models’. This led to two day’s work as an extra in Eastenders when they filmed in Marbella, and more memorably, being a Genie in a Romanian chocolate bar commercial. These days however, my TV appearances are limited to news stories, such as the Coin fires and Ashya King saga. The impending EU referendum has also seen me hauled before the cameras to discuss the impact that Brexit might have on the expat community. So far this year I have voiced my opinion on BBC, Chinese TV, ITV and most recently Good Morning Britain, the latter entailing that I be at the five-star Puente Romano Beach Resort and Spa at 5.45am. This was, however, more than compensated by an outstanding buffet breakfast spread and my 15 minutes of infamy live on national TV. For the record, if leaving Europe means that we don’t have to endure the Eurovision Song Contest, then I’m all for it!